9x12, xv + 210 pp. Georg von Bertouch (1668–1743) was a German-born musician and military officer who spent a considerable part of his adult life in Norway. He composed a cycle of twenty-four sonatas in each of the twenty-four keys, of which only eighteen survive in a fragmentary Scandinavian eighteenth-century manuscript that originally included the entire set. Two sonatas, one of which is written in C-sharp major, are scored for trumpet, two violins, and continuo; they feature virtuosic writing for the trumpet. The remaining sonatas were probably all scored for two violins and continuo. 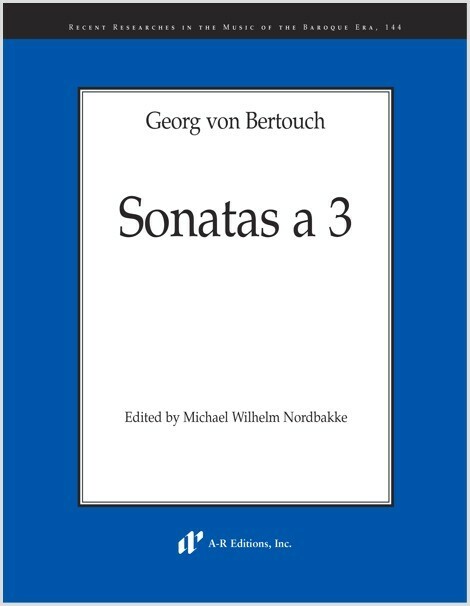 Bertouch, who in his youth had made the acquaintance of the Bach family, seems to have sent a copy of the sonatas to J. S. Bach, and Bertouch's cycle of sonatas is an interesting analogue to Bach's Well-Tempered Clavier. The edition will be of interest not only to Bach scholars and performers, but also to those studying eighteenth-century key characteristics and baroque tuning systems. Brian Clark, Early Music, Feb. 2008. Reviewer unknown, Early Music Review, 119, June 2007.